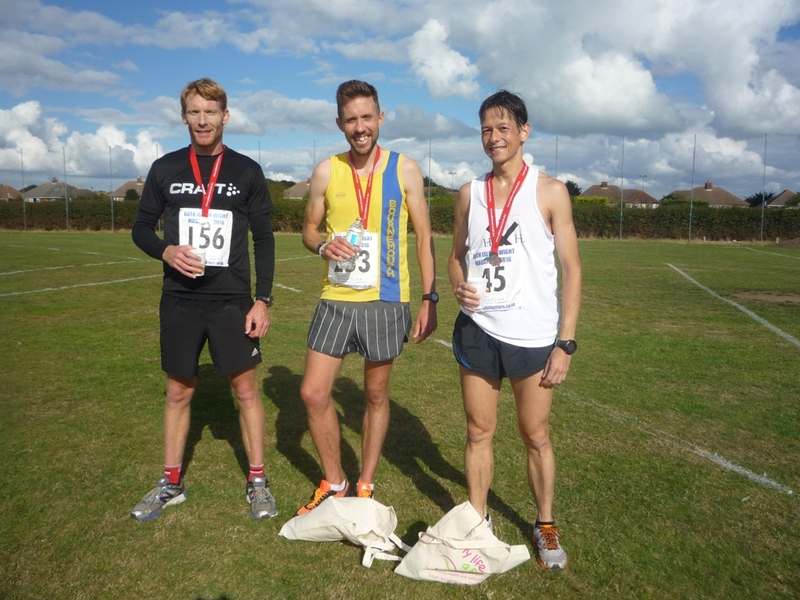 Top Three Runners: L-R Richard-Peter-James. 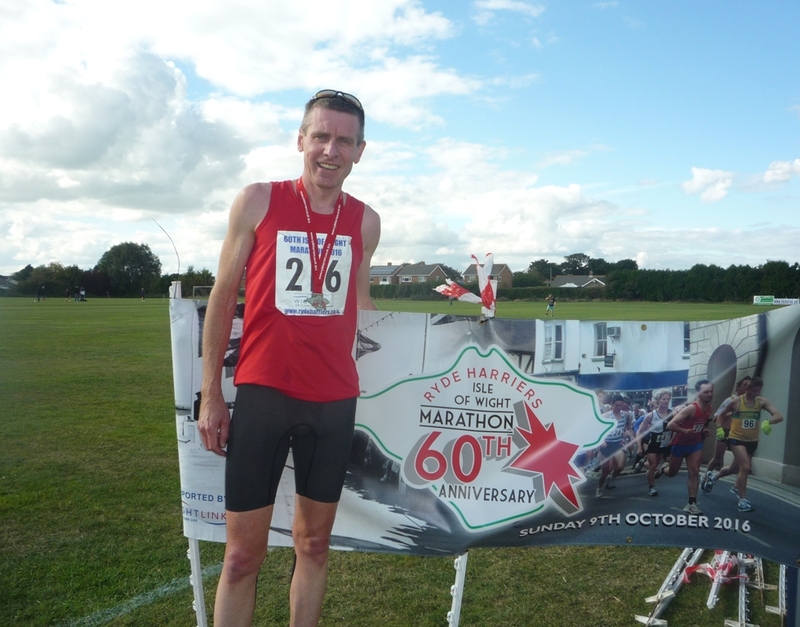 Organised by Ryde Harriers the inaugural IW Marathon was first contested in 1957, with the race won by Ken Honney of Walton A.C. in 2:35:51. For the first 56 years the race was run over a circuit in East Wight starting and finishing in Ryde. 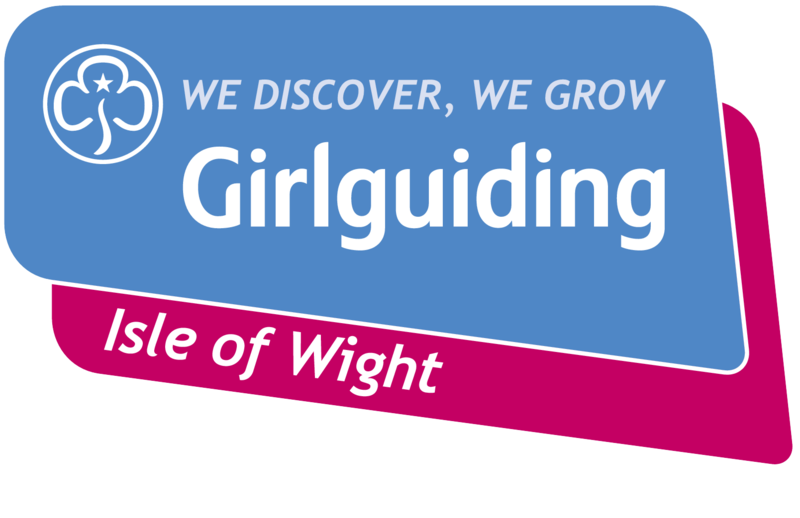 In 2013 the event relocated to its base in the grounds of the IW Community Club, Cowes and since then it has been raced over a course from Cowes to Yarmouth and back. 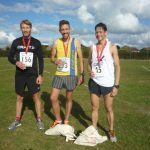 For this year’s 60th IW Marathon Ryde Harriers mounted a relay team consisting of experienced and novice runners who ran a number of short legs over the full course distance. This was in addition to the runners taking part in the usual distance of 26miles 385 years race. Three generations of the Furmidge family competed in the relay involving mum Joy, son Sean and grandson Harry. 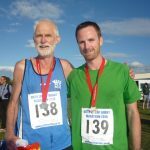 On Sunday dry warm weather with sunny spells welcomed the runners. James Chettle (Thames Hare & Hounds) held the lead for the first ten miles or so. Peter Thompson (Bournemouth A.C.) then took the initiative and held his place until the end. Peter crossed the line in 2:40:29, the fastest winning time for a decade. He had run his home Half Marathon only last weekend and set his P.B. of 2:25 in Amsterdam last year. Peter’s time for the IW course set a new record by some five minutes. James Chettle came home in 2:43:43-13 minutes slower than his P.B. of 2:30-in second place. Peter and James will renew their rivalry when they both contest the Valencia Marathon in six weeks time. Richard Lacock an unattached runner from Portsmouth ran a steady race to take third place in 2:46:20 and Edmund Fuller an unattached athlete from Claygate was fourth in 2:51:57. Reigning champion Christopher Redhead, who was born in Shanklin but lives and competes in France, was fifth in 2:52:55. An ex cyclist Chris contested the French Half Marathon Championship last weekend and did not have the strength in his legs to challenge the leaders. Chris had the consolation of being the first Male Veteran (Vet.) 40, first male Islander and first male Vet. Islander. Rounding off the top six was a Spaniard, Jorge Morell Salguero from Ibiza who added an international flavour to the event. He recorded 3:03:28. 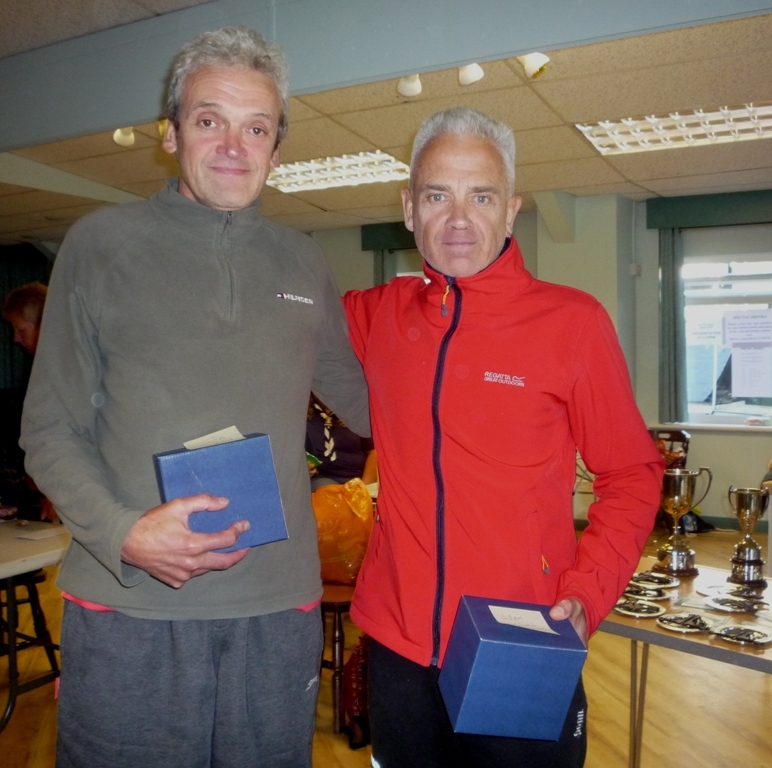 Ryde Harriers took the Men’s Team Trophy for a record 12th time with Stuart Backhouse 9th in 3:04:33, Andrew McEwen 11th in 3:09:26 – 1st Vet.55 in a new course record- and Les Cupis 12th in 3:09:59 despite suffering cramp at Porchfield on the way to the finish. Les also set a new course record- by 6 seconds -in winning the Vet. 50 category. 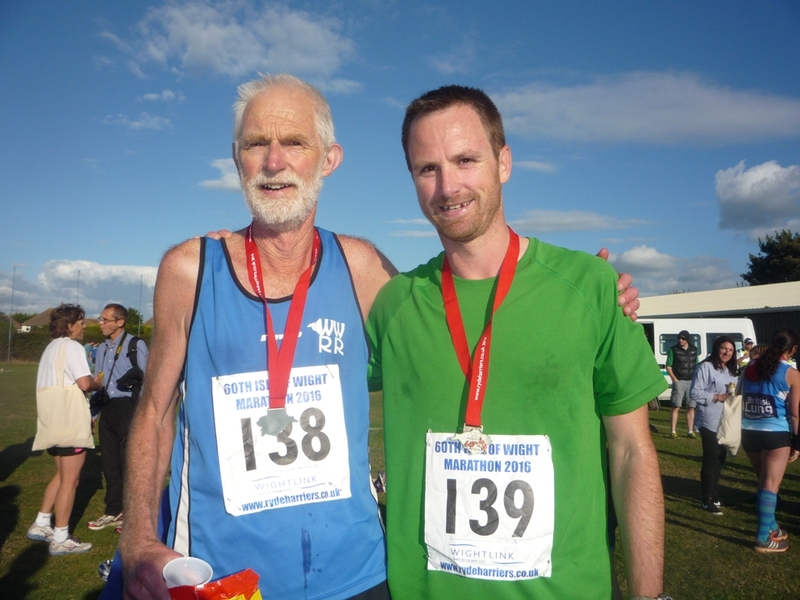 Isle of Wight Road Runners, led by Peter Wilmott, 8th in a personal best of 3:03:56 were runners up. Their ‘B’ Team took third. 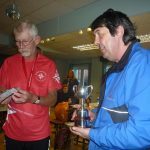 Another Ryde Harrier Jonathan Norton took the Vet.70 title plus the Bob Pawling Trophy as the eldest Ryde Harrier to finish. 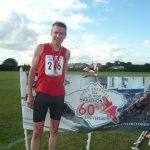 Meanwhile another Vet.70 runner West Wight Road Runner Ian Jolliffe contested his 100th Marathon-his 26th on the Island. His son Nils accompanied him and the pair finished well inside five hours. 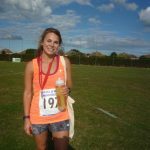 Having run a number of Half Marathons, Kirsty Morgan, an unattached runner from Ipswich made her debut over the Marathon distance and tasted victory after a steady run in a time of 3:34:22. Kirsty has visited the Island a number of times on holiday and subsequently decided to run here. 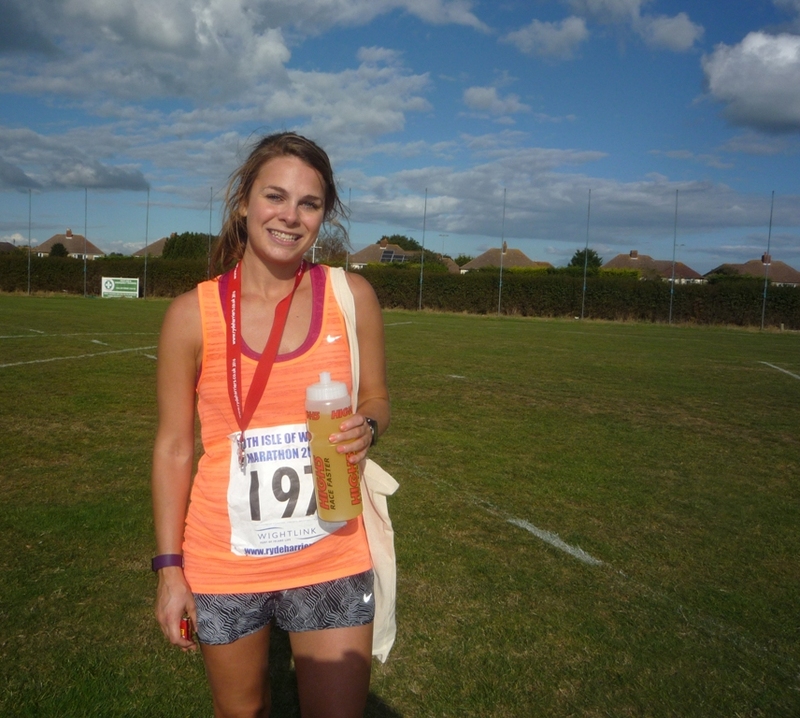 Claire Levermore (Serpentine Running Club) was second-3:37:16 and Ryde Harrier Judy McCabe was the third woman finisher in 3:41:15 and the first woman Islander. She led the trio of Ryde Harriers to success in securing the Women’s Team Trophy with Julie King 3:57:39 and Elaine Parry 4:07:16. 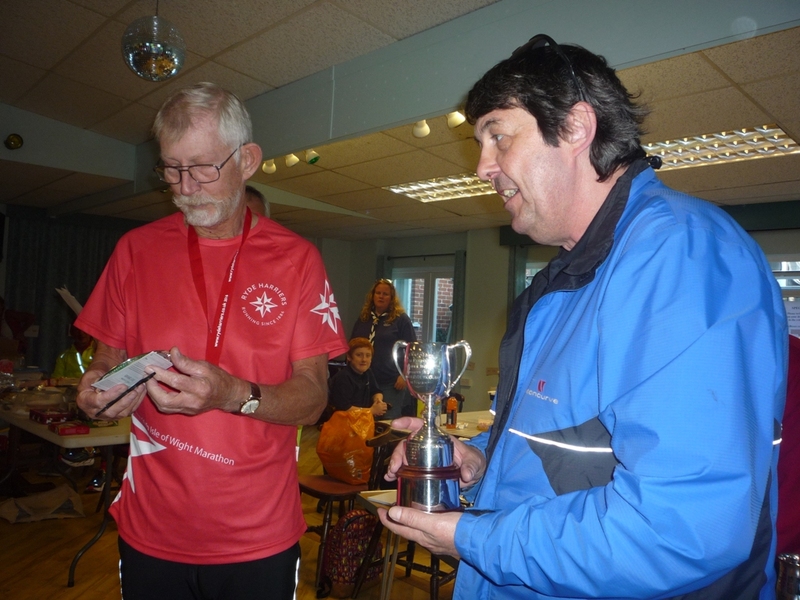 Special awards to celebrate the 60 years of the race were presented to some runners who had completed 20 or more IW Marathons. 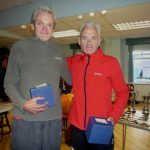 Two brothers from Fleet & Crookham A.C. Nick and Adam Holmes were honoured in this way with the presentation of a glass tankard. They both regularly undertake Island races as well as Marathons and are regular visitors to the Island as their mother has a home here.